TOKYO (MacHouse) – Yes, it’s a graphic design application again! I’m sick of making graphics applications. But I have to do what I have to do to buy bread. (No, I have plenty of rice to survive for the next 6 months or longer.) 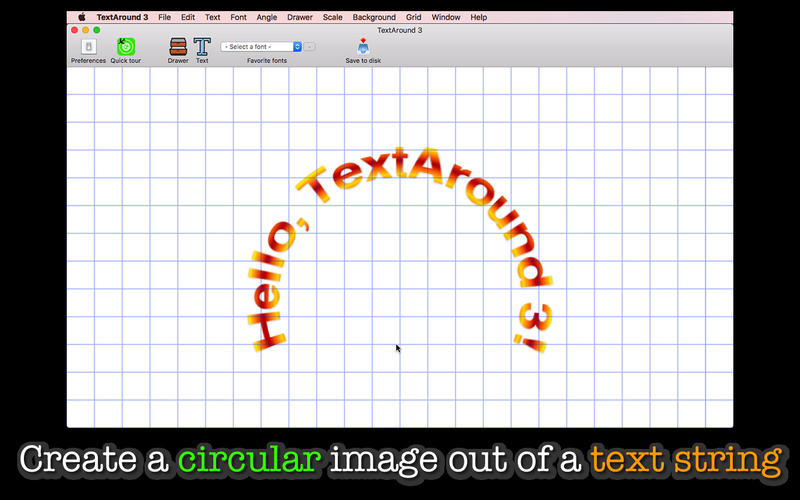 The new software title that I submitted to Mac App Store several minutes ago is called TextAround 3. And, yes, the TextAround series is still alive. It’s been built from a scratch in Swift. This series is almost four years old. What’s so special about TextAround 3 that TextAround2 users didn’t see? TextAround 3 lets you flip individual letters horizontally, vertically or horizontally and vertically. I have made so many changes such that the new version may be unrecognizable to those who have used TextAround2. Flip individual letters horizontally, vertically or horizontally and vertically. Pick one of 144 gradient colors to apply to text. Or apply a solid color to text. The user can now choose a typeface after selecting a font family. Show or not show grid lines. The user can view styled text for different font families and typefaces. Create a linear or circular image out of a mere text string. Add font families that you frequently use to the favorite font list. View styled text with different font families and typefaces. 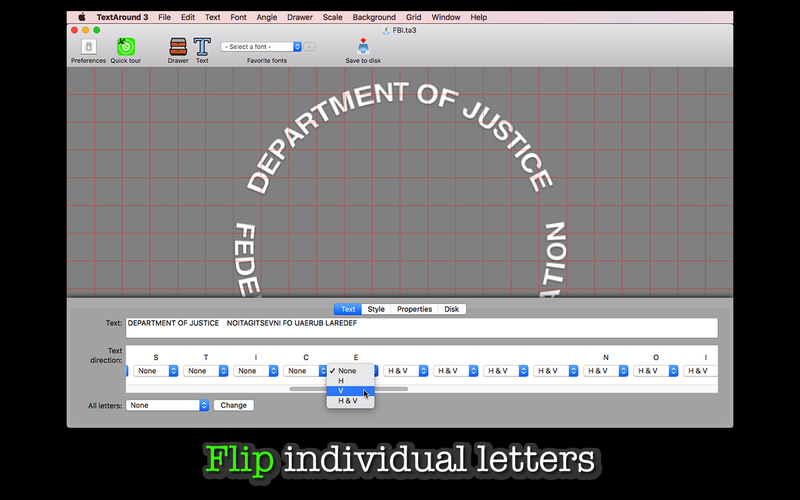 Flip all letters at a time horizontally, vertically or horizontally and vertically. Flip letters individually. Apply a solid color or gradient colors to the text image. Pick one of 144 gradient color styles. Use color filters (hue, saturation, brightness, contrast) to adjust the look of the gradient color style you select. Select a font family as well as one of the typefaces that it offers when converting a string of text into an image. Change the radius of a circular text image. Set the starting point as a degree where the first letter of a text string appears. Cast or not cast a shadow around the text image. Save the text image over the canvas to your disk. The supported export formats are BMP, GIF, JPEG, JPEG 2000, PNG, TIFF. Save current progress as a document file. Resume progress off a saved document file you select. Set up the shared folder (destination folder) so that the application can send all files to it. Show or not show grid lines. Choose one of four line colors (red, yellow, green, blue). Select one of five background colors (white, light gray, gray, dark gray, black) for the canvas. Change the scale rate (200% to 5%). Application file size: 24.0 MB. The application comes with a built-in 18-page user guide. Choose Show Quick Tour under TextAround 3 whenever you need to see it. The user can flip individual letters horizontally, vertically or horizontally & vertically. If a text string contains letters with different heights, a shorter letter may be vertically aligned to the top. If they intend to upend one or more letters, the user should consider capitalizing all letters. TextAround 3 does not merely rotate individual letters in order to make the whole collection circular. Rather, it will create a linear image with the collection of letters, first. It will then make this linear image circular. If individual letters look distorted, the user should consider decreasing the font text size, increasing the circular radius. The user cannot include the line break in the collection of letters. The application has been rebuilt from the ground up with some changes and fixes. The user can now drag and drop a saved project file directly onto the canvas to reconstruct progress. Fixed is an issue where some of the menu commands will become disabled after saving an application document to disk. Click here to download a trial version. This trial version will remain fully functional for 7 days, starting from the very moment you first launch it. If you are running this trial version under macOS 10.12 Sierra, you need to quit the application right after the first launch to evade a Sierra bug. TextAround 3 is a product of Tom Bluewater. This app is super buggy and largely un-usable. Menus/buttons frequently disappear or become un-selectable. Resolution of the text modification is poor. If this was a sub $5 app, I could see living with these issues. But for $19.99, this is totally unacceptable. I’d like my money back, as I will never use this App. 1. Menus/buttons frequently disappear or become un-selectable. I am afraid which menu command or button you are referring to. Let me suppose you are referring to the save to disk tool button. If toolbar button will remain grayed out until you set up a shared disk. How about the delete (-) button net to favorite fonts drop-down menu. The delete button will stay disabled until you select a favorite font to remove from the menu. 2. Resolution of the text modification is poor. If you rotate graphic objects and then make a bitmap object, a result may not be so satisfactory. Is that really a surprise. You are freely to contact the seller (Mac App Store). Thank you for your comment. I understand that you want to apply different font family names to individual letters. At this point, there is no way of making that happen. I haven’t taken a close look, but I think that’s possible. If I want to make it happen, however, I am afraid that I have to start from a scratch with that concept. I can’t even promise that I will incorporate your request into a next version because it sounds like it will be more difficult for users to learn how to use the application. The app has crashed twice – is it compatible with High Sierra? While using it, I cannot select any fonts in the font menu and cannot get any text to display in the center window of the app and cannot place anything on a circle. Jack, I’m sorry for the trouble. I’ll get back to you in several minutes. Jack, the application works for me under High Sierra. But I know why it crashes. Immediately after you launch the application, please quit it. If you launch it again, it will never be drived to crash again. That’ll all it takes. Thanks, I just quit and restarted and it seems to not crash now however it still doesn’t work. I cannot get any text in the center window to appear. Please send screenshots to junk913@gmail.com, and I’ll be happy to point out why you don’t get what you expect. The application does not work with Mojave 10.14. It actually works under Mojave. But if you want a refund, please contact Mac App Store. For some reason after I save my file, it shows up blank in the folder. Can you address this issue, please? Hello, Heather. I’m sorry for your problem. We would be happy to assist you if you give us more information on how the issue you reported earlier occurred. We don’t even know under which macOS system version you are running TextAround 3. Reading ‘Questions?’ at the top will be a good start. As long as I run it under macOS 10.14.3, I don’t have trouble opening a project file.